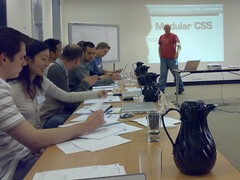 Our Melbourne CSS & Accessibility workshop was wrapped up on Friday. We had a great group of people asking us questions and keeping us on our toes for two days. We’re now heading back to Sydney for our next workshop on Monday 14 and Tuesday 15 May. Hope to see you there! The workshop was above my expectations with very good presentations and good explanations – and a readiness to answer any questions. Exactly what I needed. Put the pieces of the CSS puzzle together for me. Marvellous!